Why Does The Front Of My Player Turn Off When Watching A Movie? 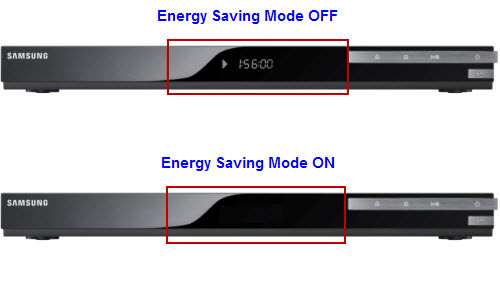 Your Blu-ray Player comes with an Energy Saving mode that reduces power consumption by setting the front panel to turn off automatically when there is no operation for 5 seconds. 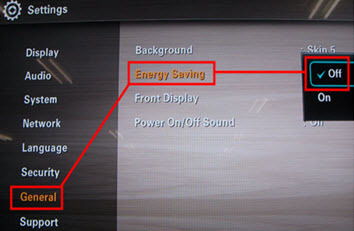 If you’re watching a movie and Energy Saving mode is ON the front panel display will be black as if the player is off but the Blu-ray movie will continue to play. You won't be able to see how long the movie has been playing unless you press a button on the remote control, but the display will turn off again. To Disable Energy Saving mode, follow the steps below. 1. 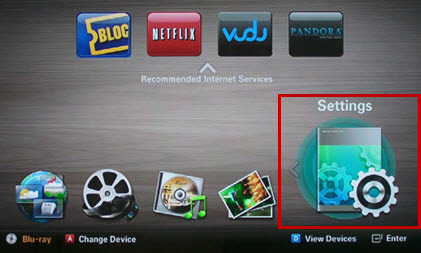 Turn on your Blu-ray Player and wait for the Home Menu to display. 2. Using the left and right arrow buttons on your BD remote move to Settings and then press enter. 3. Using the top and bottom arrow buttons on your BD remote move to General and then press enter. 4. Using the top and bottom arrow buttons on your BD remote move to Energy Saving and then press enter. The sub menu is displayed. 5. Using the top and bottom arrow buttons on your BD remote move to OFF and then press enter. A blue checkmark appears to the right of OFF. Energy saving is now disabled. Does My Blu-ray/HTS Player Support 5GHz?